There are several ways to detect infrared light in an electronic circuit, but the most common is with a device called a phototransistor. You can buy a phototransistor for less than a dollar at RadioShack or any other store that stocks electronic components. To understand how a phototransistor works, first review how a transistor works. A transistor has three terminals, known as the base, collector, and emitter. Within the transistor, there’s a path between the collector and emitter. How well this path conducts depends on whether voltage is applied across the base and the emitter. If voltage is applied, the collector-emitter path conducts well. If there’s no voltage on the base, the collector-emitter path doesn’t conduct. In a phototransistor, the base isn’t a separate terminal that’s connected to a voltage source in your circuit. Instead, the base is exposed to light. When infrared light hits the base, the energy in the light is converted to voltage, and the emitter-collector path conducts. Thus, infrared light hitting the base has the same effect as voltage on the base of a traditional transistor: The infrared light turns the transistor on. 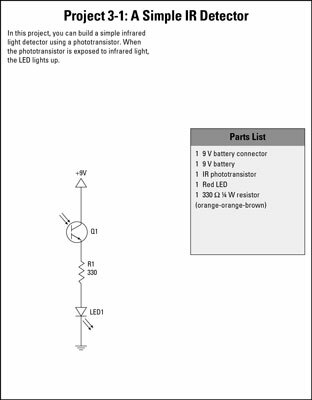 The brighter the infrared light, the better the emitter-collector path conducts. When infrared light is present, the collector-emitter circuit conducts, and the LED lights up. Thus, the LED lights when the phototransistor is exposed to infrared light. 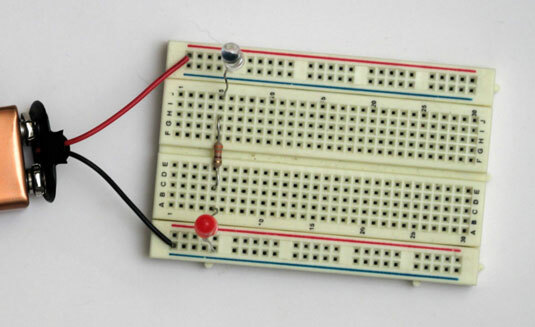 This project shows you how to build this circuit on a solderless breadboard. 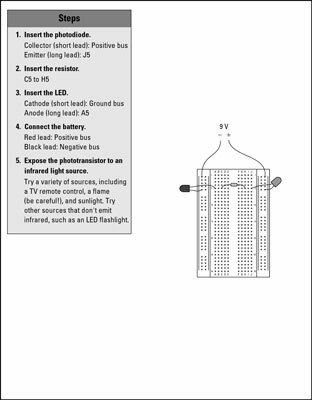 Once you have assembled this circuit, try exposing the phototransistor to different light sources to see whether they emit infrared light. One sure source of infrared is a TV remote control. Point the remote at the phototransistor and press any button on the remote. You should see the LED flash on and off quickly as it responds to the infrared signals being sent by the remote. Another interesting source of infrared is an open flame. Be very careful, of course; Don’t burn down your house just to see if the flames produce infrared light. If you have a small gas lighter, light it up and hold it near the phototransistor.